This entry was posted on Tuesday, January 10th, 2012 at 3:59 pm	and is filed under Food, Recipies. You can follow any responses to this entry through the RSS 2.0 feed. You can leave a response, or trackback from your own site. Why are they called “Undefeated Rainbow Racer Brownies?” There is neither anything rainbow nor racer about them. 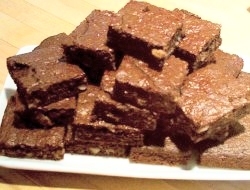 Naomi’s story (from the recipe): Here’s the background of these fabulous, moist brownies. When I was eight years old I played soccer for the Rainbow Racers and we were undefeated. My mom made these brownies for us and boy–they are so good you’ll eat them all day! I still want my brownies.